The fall 2018 Community Scientist Academy graduates are (l-r): Christine Murrell, Karen Boone, NaKisha Holmes, Sherita Williams, Sarah Pilcher, Jerusha Wynn, Dr. Julia Chears-Young, Jay Young and Ferrin Lunestad. 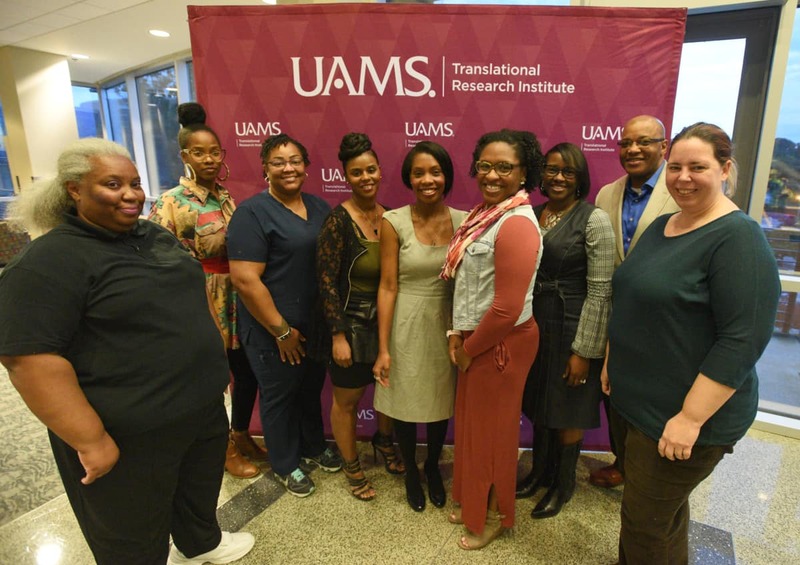 Nov. 16, 2018 | Researcher Tiffany Haynes, Ph.D., threw down the gauntlet for the 10 graduates of the UAMS Community Scientist Academy. “You can’t stop here,” Haynes, assistant professor in the UAMS College of Public Health, said in her keynote speech. She urged the group at their Oct. 30 graduation to share their experience in the academy on social media to help spread the word. She advised them not to be shy about letting UAMS researchers know about their interests and the needs of their communities. Haynes got enthusiastic applause, and academy graduate Ferrin Lunestad of Hot Springs said afterward that the call to action resonated with her. The UAMS Translational Research Institute established the Community Scientist Academy in 2016 on the recommendation of its Community Advisory Board. Its purpose is to increase community understanding about the research process and offer research decision-making opportunities to communities, patients and other stakeholders. These opportunities include reviewing grants; advising on research projects; serving on community review boards, community advisory boards, and patient and family advisory councils; and assisting with ARresearch, the Translational Research Institute’s research participant registry. Through five academies it has graduated 54 Arkansans from diverse communities and a variety of socioeconomic backgrounds.